Nisga’a Nation, comprised of four communities; New Aiyansh, Gitwinksihlkw, Laxgalt’sap, and Gingolx, is located in north western B.C. In the 1890s, Nisga’a hereditary chiefs and matriarchs formed the Nisga’a Land Committee and began to aggressively pursue self-government and title to their lands. 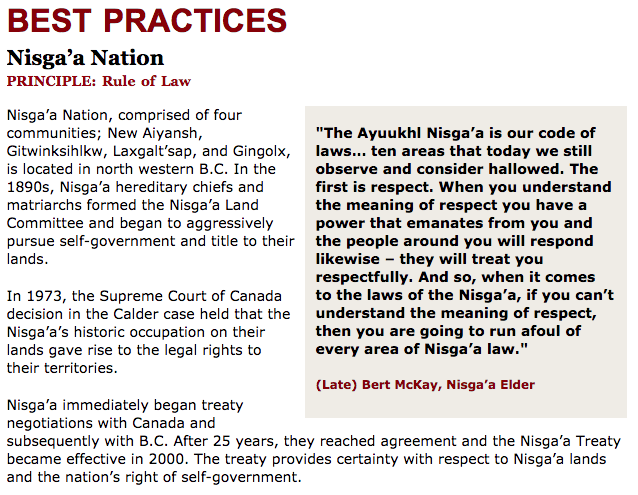 People of the Nisga'a Nation discuss custom and tradition before the Indian Act. They tell how they made the move back to traditional ways through strategic planning and abandoned oppressive ways of the Indian Act. Native Nation Building TV: "Bonus Segment on Native Nation Building"